I recently met an exceptionally interesting man. He told me that he was a historian, and that he had a theory. According to the Hindu scriptures, he said, ancient India was full of winged machines in which the gods flew from place to place, showering the earth with blessings as they passed over it : I suppose this was the Vedic equivalent of a Presidential plane. Anyway, my historian said, as the gods flew around, paying state visits, they acquired a lot of knowledge from other countries, though I personally would have thought that if they were gods, they already knew it all. However, I do not want to be too carping a critic. My friend then told me that amidst the other titbits of information brought home in these divine aeroplanes was an English grammar. He was very serious about it. He said that that was the reason Indians today spoke such excellent English : they had been speaking it since the days of the Mahabharata. I would acccept this more readily if it were not a fact that in the days of Mahabharata, English as we know it did not exist. No. I think we must accept, however reluctantly, that English first came to India with the British. What we must come to now is the fact that all colonial literature, written in the language of the colonist, is bound to be provincial. A kind of Indian literature in English started at the same time as a kind of literature started in the other colonies of Australia and Canada. It cannot be said that the literature produced by any of these three colonies was any better or any worse than the literature produced by others. Indeed, they all resemble each other to some extent. One of the facts about colonies, especially in the days when ship under sail from England to the outposts of Empire were, considered the quickest and most reliable carriers of news and mails—there was no alternative but pigeons—was that the colony was always some weeks or months behind the mother country in the receipt of pure news. This being the case, the colony was usually some years behind the mother country in the receipt of new literature. The lonely writers of Australia and Canada, and therefore of India, for those who chose to write in English, were always some years behind contemporary literary movements in England. In the 1930s three Indian novelists, all of whom are still alive, emerged. These were Mulk Raj Anand, R. K. Narayan, and Raja Rao. Mulk Raj Anand is an old and dear friend of mine, yet to much of his writing, as writ ing in English, Yeat’s criticism applies. He writes as though he was trans lating from his native Punjabi into English, hence the recurrent phrases in his work which may sound ridiculous to the reader—for example—”He waved his head in silent assent,” or “O thou raper of thy mother ! Thou raper of thy sister !” Anand started to write his novels at a time when the English book market was (a) empty of exotica and (b) when the intellectuals in England were mainly leftists. He wrote of India, which made him exotic, especially since, unlike Kipling, still alive then, he was an Indian. He wrote of the deprived and poor from a Marxist standpoint, which made him popu lar with the intellectuals. But his work still demands respect, especially his latest work. R. K. Narayan was a very different figure. While Anand lived in England, Narayan never strayed far from his own Mysore. 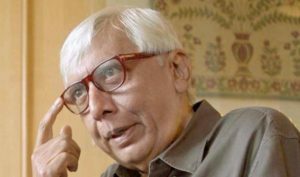 While Anand never seemed to have taken breath in pouring out his sentences, Narayan was a very careful novelist, with a perfect sense of time and place. The town he created, Malgudi, has a truth of its own, drawn from observation and sympathy. Narayan had no political bias, but an intense awareness of people and a sense of sympathy with their predicaments. Anand wrote of huge pre dicaments, Narayan of small ones. But a lot of novelists, like Forster—and Narayan is a sort of Indian Forster, dryly witty, though never cynical, always watchful, and able to construct wordlessly upon his words—have described huge events through small ones. Narayan is incidentally the first Indian writer in English to have shown himself to be a rider of that strange beast, a sense of humour. Mr. Khushwant Singh, the other day, described Narayan’s style as “too simple”. I think his style is very complex. Anyone who is able to be simple is far more likely to be complex than a person who is striving to be complex in thought and style. This is my main criticism of Raja Rao, and perhaps this is why I find his books utterly unreadable. But an interesting common denominator between these three writers is that all of them achieved some reputation abroad, and that until they had achieved this reputation, they were uniformly without honour in their own country. Mulk Raj Anand lived abroad for a number of years, Raja Rao still lives abroad. R. K. Narayan has always lived in India, though since the 1950’s he has travelled a lot. Apart from the obvious differences between them as writers, there are differences between the degree of each one’s success. Narayan, for example, is probably the most successful in America : on the European continent, where they still entertain the myth of the mystical Oriental, Raja Rao is a coterie figure : Mulk Raj Anand is mainly read in Russia and the Eastern European countries, where the roubles pile up around each of his books. Yet for the normally literate reader of English in India, all three are the same. They are all equal in splendour, because they have made names for themselves abroad—abroad being a term that embraces Connecticut as well as Kiev, and assumes both to be the same. Since the war, of course, there has been a flood of Indian novelists who produce in English. They are all fairly competent and fairly unremarkable. The exception is G. V. Desani, who is a kind of freak. Desani in 1948 produced one book, All about Mr. H. Hatterr, which seems to me a prose master piece. T. S. Eliot was one of those who praised it when it first appeared, but it was then forgotten for more than 20 years. Desani, like all the others I have mentioned, won a reputation for himself in England, and he was accepted in India because of this. One reason for this uncritical acceptance of English critical praise seems to me the complete absence of any Indian criticism of English writing. This in itself is due perhaps to the initial fact of Macaulay’s system of education. The English told one, in the textbooks, what should be read and what shouldn’t. Ours not to question why. Naturally, therefore, it appeared to college instructors and school teachers that if and when Indian writers received the imprimature of an English publisher and the praise of English critics, they were OK. This lasted for a while, and then the tide turned. As with Professor Iyengar, so with most other Indian critics; every writer who was able to hobble as far as a printer’s shop and pay to be published was assured of a decent review, so as to enable the homegrown product to flourish. This has led to a really dramatic fall of standards in Indian literature written in English. …there have been others of promise, when they lived overseas, whose promise seems stifled when they come home. One of them is Adil Jussawalla. His first book, Land’s End seemed to me, and to many other poets in England, one of the most brilliant first books published since the war. I have talked tonight about the fact that no proper criticism of Indian writing in English exists in India. There is no real literary magazine : there are no really professional critics. One reason, it seems to me, is that there are few really professional writers. Until quite recently, I lived purely on my earnings as a writer : in a sense I still do, since the function I perform for the United Nations is that of a professional writer. But very few writers in India have ever been professional in that sense—that is, that they exist and support their families on what their pens spit out and their typewriters cough up. Thus one has an enormous number of what could be called Sunday novelists and Sunday poets, and such writers deserve whatever criti cal appreciation is available : i.e. that of Sunday critics. Poets of potential like S. Santhi and Arvind Mehrotra have often spoken to me of the difficulty of obtaining proper criticism in India, and I would say this is one of the most gigantic drawbacks for any writer who works in English in India.